Nourish. Stimulate. Grow. Love Your Hair Again! Laser Hair Loss Treatment Therapy is the latest non-surgical scientific approach to treating hair loss, thinning hair, baldness and problems associated with the scalp. 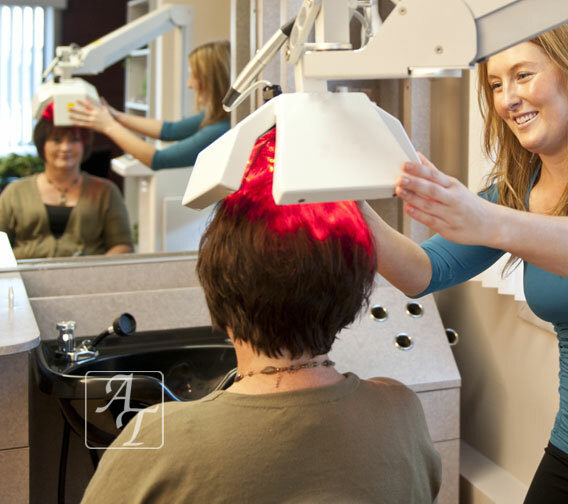 Both men and women experiencing early stages of hair loss (Norwood 1-3), may benefit from and see positive results from utilizing low level laser hair therapy. Laser Hair Therapy Treatment for Hair Loss – Richmond, Va.
Laser Hair Loss Treatment Therapy utilizes a device containing therapeutic low level lasers developed in Europe. Laser-induced “photo-bio therapy” treatment delivers specific low level laser light energy directly from laser positions designed to cosmetically treat the appearance of thin, fine, damaged hair. Physicians are praising this technology as an effective treatment for both men and women suffering the devastating effects of hair loss. With laser hair loss treatment therapy, you can achieve thicker, fuller, shinier, and healthier looking hair. Increases the blood supply to the scalp by 54% after only one treatment. Stops the progression of hair loss in 85% of patients. Increased hair strength and elasticity. Fuller, shinier, softer, thicker hair. For Post Operative Transplant surgery, laser treatments have been shown to help newly transplanted hair to thrive and increases the healing process. Repairs damage normally caused by chemical services. Delivers light energy directly from different positions without loss of light properties to insure appropriate dosage. Treatments for Men and Women – Get back the look you want. The low level lasers are “soft” lasers often referred to as “cold” lasers, and do not have the thermal-component that we normally associate with laser light. Rather, Low Level Laser Hair Light (LLLT) therapy treatments utilize a device containing therapeutic soft low level light lasers which delivers light energy directly to the scalp. Laser hair therapy was developed in Europe and used for improving hair volume and hair shaft quality and prolonging the life of hair color and improving hair colors and perms. Will Laser Hair Therapy Work for Me? 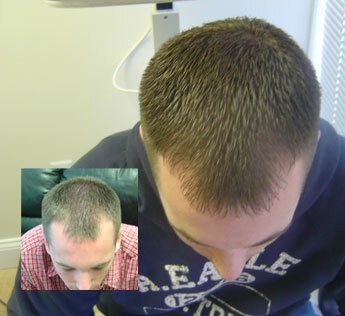 Both men and women experiencing early stages of hair loss (Norwood 1-3), may benefit from low level laser hair therapy. Laser hair therapy has also been shown to be especially effective when used in combination with a multi-therapeutic hair loss treatment and program such as our exclusive dhtSENSOR hair loss prevention and control program. Low level laser light is compressed light of a wavelength from the cold, red part of the spectrum of electromagnetic radiation. It is different from natural light in that it is one precise color; it is coherent (it travels in a straight line), monochromatic (a single wavelength) and columnated (it concentrates its beam in a defined location or spot). These properties allow laser light to penetrate with no heating effect, no discomfort and no known side effects. The unique laser light penetrates into the scalp tissue where it stimulates the microcirculation and improves cellular metabolism and protein synthesis. Each patient responds differently depending on the severity and type of hair loss, however the average person will start to notice a change in the appearance of their hair in as little as 18 to 24 treatments. At Advance Technique in Richmond, Virginia, we offer FREE private consultations to help you determine which treatment is best for your individual situation. See for yourself how much you have to gain. Schedule your free, confidential hair loss evaluation today and discover your perfect hair loss solution. Restore Your Hair. Restore Your Life. Book your free, private hair loss evaluation today.